You’ll never have to sacrifice sound quality for portability with ZIPP’s deep bass, full midrange, and crisp highs. Connect over Bluetooth, WiFi, Airplay (iOS), Airplay 2 (Coming soon), or DLNA (Android) and enjoy sound that can be heard throughout the whole room. • WIFI & BLUETOOTH CONNECTIVITY: Use WiFi for longest range and high fidelity music quality, or Bluetooth to stream from any device. Also supports Airplay (iOS), AirPlay 2 (coming soon), DLNA (Android) and Spotify Connect. 1x 1” tweeter. 1x 3” woofer. Caribbean Green color. Play anything through Bluetooth. Box was opened to test, and the speaker is in perfect condition. Music should never be off limits. Made to go anywhere and do anything, you’ve never seen a wireless speaker quite like this before. Libratone Loop Wireless Speaker NEW. Condition is New. Shipped with USPS Priority Mail. IF IT IS NOT SHOWN IN THE PHOTOS OR DESCRIBED IN THE TEXT, IT IS NOT INCLUDED. It can even be wall-mounted and will add to the décor of any room. Apple's AirPlay wireless streaming technology works with iPhone, iPod touch and iPad, or Mac and PC with iTunes 10.1 or later. It can stream lossless audio files and MP3s from iTunes. 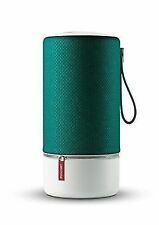 LIBRATONE ONE Click Caribbean Green Bluetooth Speaker New & Sealed LOOK!!! With noisy reduction and echo cancellation. Splash proof design withstands weather changes and splashes of water. Weatherproof yes. No matter where you go, your music goes with TOO! Product type Bluetooth speakers. Bluetooth Yes. Connections 1x 3.5 mm mini-link, 1x Bluetooth 4.1. System or compatible with Bluetooth system. Handsfree: This unique acoustic technology sends sound waves through 5 built-in speaker drivers in all directions. Color: Cerise Red. Product Type: Bluetooth Speaker. Bluetooth: yes. No matter where you go, your music goes with TOO! 360 ° FullRoomn: This unique acoustic technology sends sound waves through 5 built-in speaker drivers in all directions - Connect with each other: Connect up to 2 speakers in one or more rooms. - Charging: With the practical carrying handle and a battery life of up to 10 hours, it is easy to carry. You’ll never have to sacrifice sound quality for portability with ZIPP’s deep bass, full midrange, and crisp highs. Compared to other Bluetooth, WiFi, Wireless Speakers, and Airplay speakers, ZIPP’s much larger size produces sound that can be heard throughout the whole room. You’ll especially love the enhanced integration with Spotify, and how ZIPP streams any of your favorite audio and video services natively. WiFi AND BLUETOOTH CONNECTIVITY: Also supports Spotify Connect, AirPlay (iOS) and DLNA (Android). Customises the appearance of your Zipp Mini Wi-Fi and Bluetooth speaker. UPC: Does not apply. EAN: Does not apply. We will happily work with you to find a solution to any problem. Splash proof design withstands weather changes splashes of water. Amazing 360-degree sound deeper bass than other popular portable Bluetooth speakers on the market. "Paperback book" shape makes it convenient to take anywhere. Connect over Bluetooth, WiFi, Airplay (iOS), Airplay 2 (Coming soon), or DLNA (Android) and enjoy sound that can be heard throughout the whole room. Designed for ultra-portability, ZIPP is the best portable speaker for multi-room listening. Sound for a unique full-room sound experience. You’ll never have to sacrifice sound quality for portability with ZIPP’s deep bass, full midrange, and crisp highs. Connect over Bluetooth, WiFi, Airplay (iOS), Airplay 2 (Coming soon), or DLNA (Android) and enjoy sound that can be heard throughout the whole room. Type: Portable speakers. It will be notified to you when you request for a RMA. Australia, Belgium, Brazil, Canada, Croatia, Denmark, Estonia, Finland, France, Germany, Gibraltar, Great Britain, Hong Kong, Hungary, Ireland, Israel, Italy, Japan, Latvia, Lithuania, Luxembourg, Malaysia, Malta, Netherlands, New Zealand, Portugal, Singapore, South Korea, Spain, Sweden, Switzerland. You?ll never have to sacrifice sound quality for portability with ZIPP's deep bass, full midrange, and crisp highs. Connect over Bluetooth, WiFi, Airplay (iOS), Airplay 2 (Coming soon), or DLNA (Android) and enjoy sound that can be heard throughout the whole room.